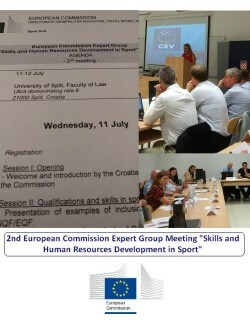 The second meeting of the European Commission Expert Group on “Skills and Human Resources Development in Sport” took place on 11 and 12 July in Split, Croatia. EOSE attended the meeting as an observer and on this occasion was represented by its Director of Standards, Ben Gittus. The event was opened by the European Commission and a welcome was extended from the Croatian Central State Office for Sport who briefly described the sport system in Croatia. Qualifications and skills in sport was the theme of the first session where representatives from Ireland (Sport Ireland Coaching), Germany (DOSB) and Estonia (University of Tallinn) presented national developments in linking national sport qualifications to national qualifications frameworks and the EQF. The Expert Group is currently preparing recommendations on the skills and competence requirements for coaches. The next session focussed on the education of coaches, beginning with a presentation from the International Council for Coaching Excellence (ICCE). The session concluded with an inspirational presentation by Tuomas Sammelvuo from the European Volleyball Confederation who presented his own journey from playing volleyball at the highest level to embarking on a new career as a coach. On the following day the session started with a presentation on the Estonian Coach Register, the system of registration for coaches in Estonia. Discussions around coaching were concluded by debating the scope of the recommendations; further work will now take place before the next meeting of the group. Following the Expert Group meeting, a national conference with the title “Talent and Dual Career in Sport” took place on 12-13 July 2018, which Ben took the opportunity to attend on behalf of EOSE, the conference included an interesting session on the structure of sport in Croatia as well as a range of talent development and dual career presentations from national and international speakers. 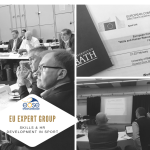 Ben said after the event: “Projects related to skills and qualifications development make up a large part of the work of EOSE so it is pleasing to a focus on these themes and a dedicated Expert Group within the European Commission. This meeting was a good opportunity for Member States to share best practice and work towards the new coaching guidelines. 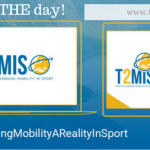 It was especially pleasing for EOSE to see a session dedicated to learning mobility, a topic we have been supporting for several years”. 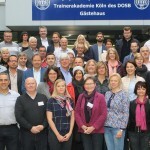 The next meeting of the Expert Group is due to take place in Austria in November 2018. 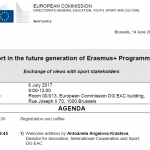 The Expert Group on Skills and Human Resource Development in Sport was set up on invitation of the European Commission under the Third EU Work Plan for Sport (2017-2020).